Increase safety for your divers. Rebreathers are a major component of the diving we do at Blue Foot. With the more common use of rebreathers many, like us, are making longer and deeper dives. As one takes on these more aggressive profiles there is a need to recognize the greater possibility of DCI. If you undertake aggressive profiles often enough, it is inevitable that some will get bent at one time or another. Therefore we strongly believe in the use of portable and fixed Hyperbaric chambers to treat DCI as soon as possible. One of our primary goals is to widen the use of Hyperbaric Chambers to increase diver safety. Blue Foot Diving offers hyperbaric chambers for sale and lease. We are certified chamber instructors through International Board of Undersea Medicine and offer courses regularly. Our commitment to safe diving means that we attempt to integrate our chambers in our expeditions whenever we can. As rebreather and expeditionary diving on yachts and live aboard dive boats becomes more popular many individuals are pushing the boundaries of fitness, equipment, ability and physiological understanding. Often dives are undertaken in locations a long way from appropriate help should Decompression (DCS) strike. Even an experienced, well trained, well planned team must realistically expect a DCS incident at some point. Portable hyperbaric chambers / stretchers are an excellent and now affordable option to cover this eventuality. To learn a little about this technology, to purchase or lease a unit or to get training in the use of chambers please read on. Blue Foot Diving is proud to offer the SOS Hyperlite Hyperbaric Chamber which comes in two variants, the 24-inch and 42-inch diameter models. The new Hyperlite is truly innovative, quick deployment, first aid medical equipment. The product of newly developed technology, manufactured using modern high performance fibre materials to their best advantage. 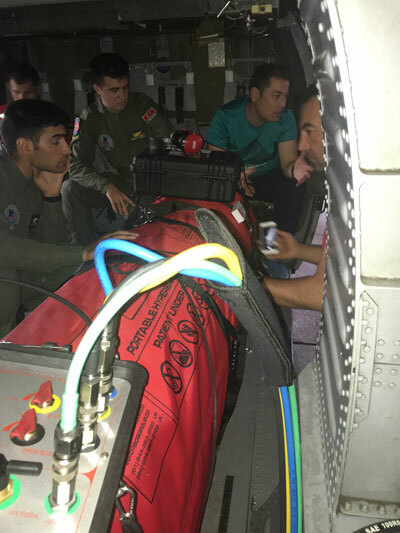 Like a hyperbaric chamber, it provides 100% oxygen on demand through a BIBS mask or hood, whilst pressurized with air and is suitable for use anywhere from diving sites, remote locations, war zones, medical centers, and ‘on the move’ in aircraft, helicopters, boats, submarines, ambulances and other road vehicles. The overriding advantage of the Hyperlite is its lightness, foldability and versatility. These are very significant benefits where inaccessibility, inclement conditions and/or other dangers may be present at an accident site. Treatment starts right there, with final resolution likely to be some way away where specialize hands-on medical support is available. 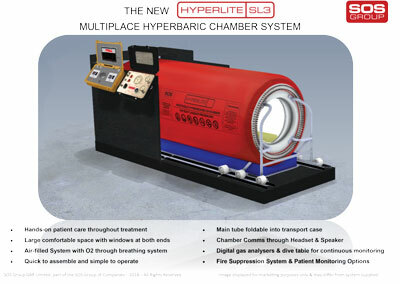 Hyperlite portable chamber [link to new brochure], 24″ and 48″. Full ASME and PVHO certifications which meet the most stringent standards for use worldwide. Available for sale and rent. Steel deck decompression chambers of varying sizes also available for sale and rent. Most divers know or should know that decompression illness is best treated as quickly as possible! Twenty to twenty five minutes after a DCI incident you are no longer treating the bubbles more the damage done by those bubbles. The longer the damage goes untreated the less likely a perfect and speedy outcome becomes. The Navy and the commercial dive world have long recognized this. 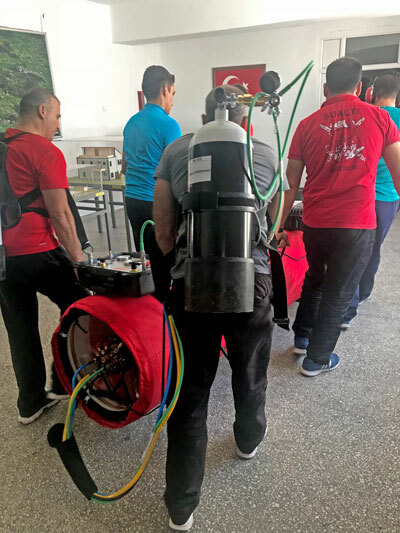 It is standard operating procedure that they have steel chambers at their disposal and can have their divers immediately recompressed for injury or decompressed as part of their dive plan. Quick treatment allows a return to diving in a short period of time because the injury was treated quickly and little damage done. Alas the same is not true in recreational technical and expedition diving. Often incidents go untreated or if a chamber ride is undertaken it will usually takes many hours and in some cases days before hyperbaric treatment is administered. Of course the above paragraph refers to differing levels of decompression sickness where many cases can be completely cured even if DCS is delayed hours. In the case of a serious POIS (pressure over inflation syndrome), an example being an AGE(arterial gas embolism) this is not the case. The consequence of a delay of more than minutes can be paralysis and death. We have all heard of individuals coming to the surface seemingly fine only to hit the deck seconds later and never recover. In these instances the only way to save someone’s life is to have a chamber on site. I chartered a vessel once when a crew member came directly to the surface from 240ft his only chance would have been a chamber aboard. Alas that was not the case. 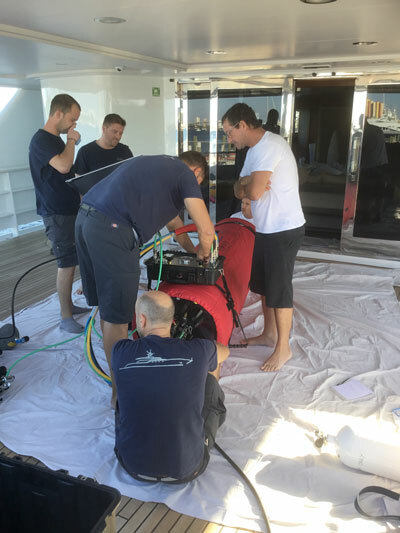 It is now possible for yachts, live aboard dive boats and expeditions to apply the same logic and procedures that the Navy and commercial dive setups use by having a chamber on site. Available now for purchase and lease through Blue Foot Diving are a number of chambers that can cover different applications and size requirements. Chambers for purchase and lease. The latest and greatest (and it is) on the portable scene is the Hyperlite unit. This chamber designed in the UK and manufactured in the USA has undergone the rigorous certifying process that makes it the only compliant ASME (American Society Mechanical Engineers) and PVHO (Pressure Vessels for Human Occupancy). In short this means it is the only portable light weight chamber one can legally use in the USA and Canada and on their flagged vessels. This chamber is small portable unit that can be used for the Navy tables 5 and 6 which are the go to tables in 95% of all decompression cases. For full details on this chamber and other portable and permanent units click here. In this explanation we will be referring to diving decompression injuries. However HBOT (Hyperbaric Oxygen Treatment ) is being used successfully for other medical applications such as wound care, traumatic brain injury and carbon monoxide poisoning to name just a few. For more information on these other applications e mail us at hyperbarics@bluefootdiving.com. Hyper means greater than normal, baro (baric) means pressure. By putting someone in a chamber we apply them to greater than normal pressure and can treat dive injuries using the same physics that caused the DCI in the first place. In essence a chamber ride is a dry dive. By pressurizing someone in a chamber, and administering a high partial pressure of oxygen (PO2) we achieve 4 major things (5 if you are a medic or doctor). The bubbles that still remain are driven back in to solution so they can slowly be released without causing damage. The patient is put on Oxygen, usually at 60ft for diving incidents. This has many benefits; it creates a gradient between inert gas in the blood and tissues which helps wash out the inert gas. Tissues that have become ischemic (lacking in blood flow) become perfuse with O2 as it is carried by Hemoglobin and in the blood plasma itself. Healing is accelerated and edema (swelling) is reduced. Patient is hydrated, this insures a good blood volume allowing better transportation of gas and waste products from the body. Time. We buy time to allow the patient to off gas and the injury area to become oxygenated and healed. 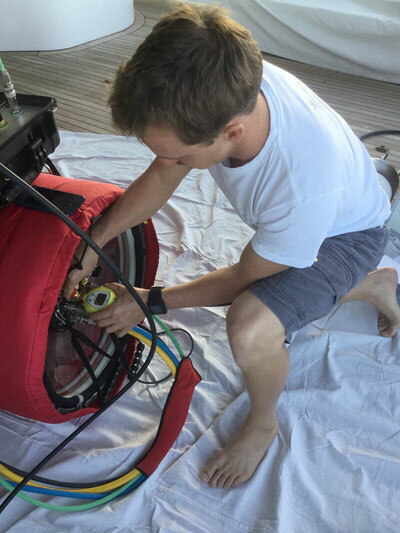 If you are interested in learning more about Hyperbarics we regularly run courses for divers through the International Board of Undersea Medicine. For more information on chamber courses types of chambers we have please contact us.